SiteWelder offers a rich set of features, and unlike others in this series it welcomes photographers from other services so it can convert your existing website to SiteWelder. During my test period, I found Mason Miller (Chief Technical Officer & managing partner) willing to bend over backwards to help me and his other customers. In fact, it was one of his customers that insisted I include SiteWelder in this series and that I interact with Mason. It’s design director and former photographer, Alan Dorow, was more hands off during my evaluation period but apparently was a driving force behind some of the great design templates offered by this service. Visit http://ronmartphoto.com or view the the site walkthrough to see just what SiteWelder offers for this $450/yr (plus $250 setup fee) service. You can play with the shopping cart feature by clicking on the Purchase Info button in the People gallery shown above, and be sure to use the slideshow link as well. It doesn’t appear to offer liveBook’s support for the auto generation of PDF images for clients (which some may not want anyway), nor was their an obvious way to add files for download from the site. Lastly, I saw no existing mechanism in its user interface for adding video as offered by liveBooks and Smugmug. While I don’t think these are mainstream features right now, it’s something to consider in the future especially if you are a Canon 5D Mark II or Nikon D90 shooter delivering video to your customers. SiteWelder’s sites are fairly easy to maintain. It’s actually very similar to FolioSnap, only better. View the behind the scenes images to see how to configure the site. I found everything to be fairly straightforward and it worked flawlessly. I also never experienced any performance issues or problems that I couldn’t overcome either myself or with a little assistance from the ever willing to please Mason Miller. 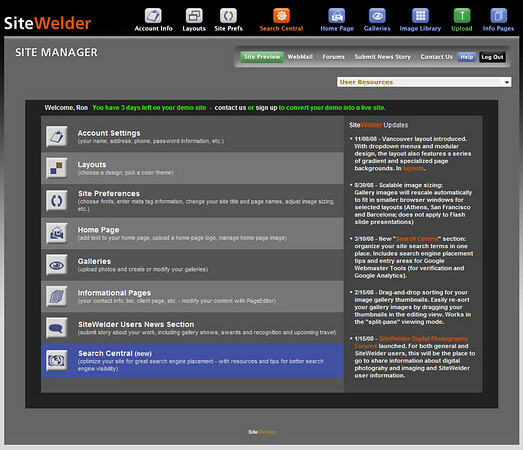 SiteWelder’s behind the scenes management isn’t as elegant or as feature rich as liveBooks in some ways (i.e., shopping cart), but it did offer the ability to do custom pages not possible with liveBooks (well, you can get it for a fee). In addition, it doesn’t take the path of FolioSnap by offering just one template in a bunch of different colors, but rather it offers a selection of 20 unique templates with numerous optional color themes for each one. It’s shopping cart is a bit crude and insufficient compared to the stellar offerings by liveBooks and Smugmug, but again it was still superior to the FolioSnap offering. SiteWelder offers an excellent Page Editor for customizations to your info pages and the home page, but I didn’t see anything that allowed me to customize the site template or anything else. I did observe that the SiteWelder support staff is happy to make these changes (some for a fee, but not always), so it’s obvious they are willing to work with you to build a unique experience (as seen at http://www.catdogphotography.com). We are actively working on an iPhone interface. Ultimately we are going to let users pick from multiple desktop and iPhone interfaces. We will have then iPhone interface available to all users this week. I encourage you to check the test site using your iPhone to see how it works. From the early preview I did, it seems like it should be similar to Smugmug’s and quite good. Famous photographer Gary Parker (#9 on my favorite photographers list), hosts both his commercial photography site and his Cats & Dogs site as well as plenty others like Mark Mann, Brian Smith, Paula Lerner and more. They also have an impressive collection of testimonials from happy customers. 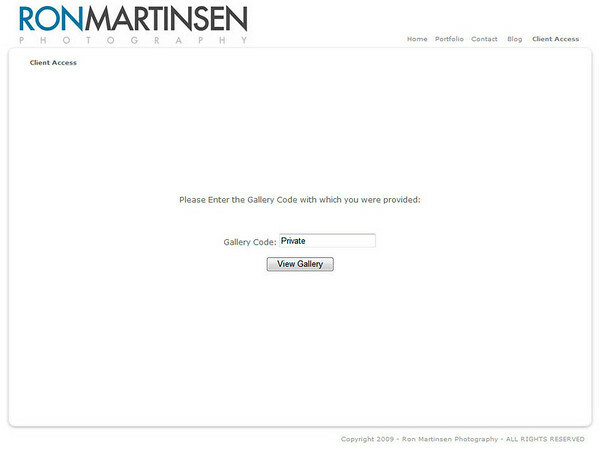 After about 5+ weeks a query for “Ron Martinsen Photography” on Google resulted in my SiteWelder site, http://ronmartphoto.com, showing up on the first page results. With a $250 setup fee and then $450 annually, the startup cost for SiteWelder is similar to the basic account for liveBooks, but you get more for your money. However, the maintenance cost of SiteWelder means that in two years you could easily spend more for SiteWelder than you do for liveBooks. However, if you like to keep your site fresh and make big changes, then liveBooks cost will run up quickly making SiteWelder the cheaper option. It’s prices are also are on par with FolioSnap’s FolioPro/FolioSuite offerings when you compare the services offered. Fantastic customer support – Simply put, Mason rocks. I got the impression that no request would be dismissed and that simple things that might cost $195 on liveBooks would simply be done for free or for a modest fee. Good selection of templates – 20 unique templates with roughly 20 well designed themes for each plus the ability to do rich custom intro and info pages means that it is quite possible to build a very unique experience on SiteWelder. HTML Based – Unlike liveBooks, SiteWelder seems to be primarily HTML based. There does appear to be some flash for the slideshows, but otherwise this is a flash-free site. Fast, Easy to Use, and Functional Design – Simply put, this site just works well. It’s clean, fast and looks great in my opinion. What’s more, its design is flexible enough that you can make a template change to your site and have a fresh new experience as often as you like. Everything’s included – Free domain name registration, email, slideshows, paypal, and lots of storage space. No iPhone support – This is something that is being actively addressed, so hopefully by the time you read this article it will no longer apply. Annual fee is rather steep – While I think the setup fee is fair, especially given their great support, the annual cost can quickly make the total cost of ownership (TCO) over two years to be greater than liveBooks, without the Search Engine Optimization performance that liveBooks boasts. However, SiteWelder doesn’t really nickel and dime you for every little change, so the real TCO might still favor SiteWelder. In addition, you get tons storage space, something that would cost you $3200 with liveBooks. Lastly, SiteWelder offers half off for a second site which is a great value for those catering two different markets / client bases. External Site Linking isn’t Intuitive – If there’s one thing FolioSnap does very well, is make it easy to add nice links to external sites. However, the Build Informational Pages section doesn’t make this process simple or intuitive. What’s more, it doesn’t allow for easy reordering so if you make an ordering mistake you going to have to contact support or do some heavy lifting yourself. I consider SiteWelder to be a viable alternative to liveBooks and superior to FolioSnap. 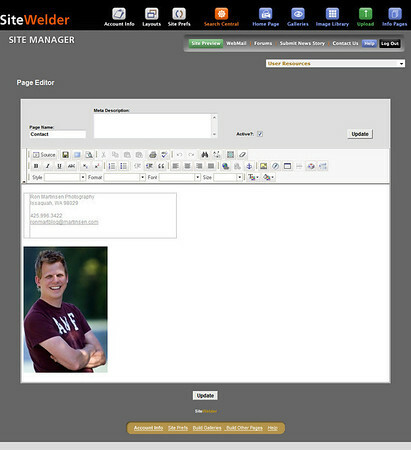 While it is similar to FolioSnap in that it offers templates, SiteWelder offers a much larger selection and is willing to work with its customers to come up with a customized experience that results in a unique web presence. It’s shopping cart isn’t as robust as Smugmug or liveBooks, but this is a company that I’m convinced will listen to its customers and respond to their needs. Overall I have no issues with recommending this photography web hosting service provider. SiteWelder has been kind enough to offer my blog readers a discount of $75 off your setup fee when you use the special code RMART when signing up for the demo. This offer expires on July 14th, so start your free trial today! Wow really interestin test. Usefula and well done. Thanks for spending your time evaluating this solution. Sitewelder's email hosting for it's customers went down over 24 hours ago and they are still not back up. After talking to them throughout the day and being told that it will be up in an hour, today, and now not answering the phone anymore, I am ready to move on. Email is the main way for a photographer to get work, and they have no backup system when they go down. Alan, one of the founders did not seem to be too helpful. The company is tiny and unprofessional. I think after this failure with there email that many photographers will be dropping them and going with a more reliable venue, such as Livebooks. I have been with them from the beginning and they have not been able to grow with the amount of customers they have. I hope they fail. Wow, I'm sorry to hear you are having troubles with them. It seems that many sites were it with something this week as Smugmug went down too. It appears to be back online now. Yes, they are a small company which makes things like this tough, but they still have families to feed so I wouldn't be so harsh with them. I'm now using Zenfolio at http://ronmart.zenfolio.com which I think is great. It's probably time to let all your clients & others know what your alternate email address is.